Hamilton's first automatic models were introduced in 1954... 1953 if you want to start with the Hamilton Illinois line. 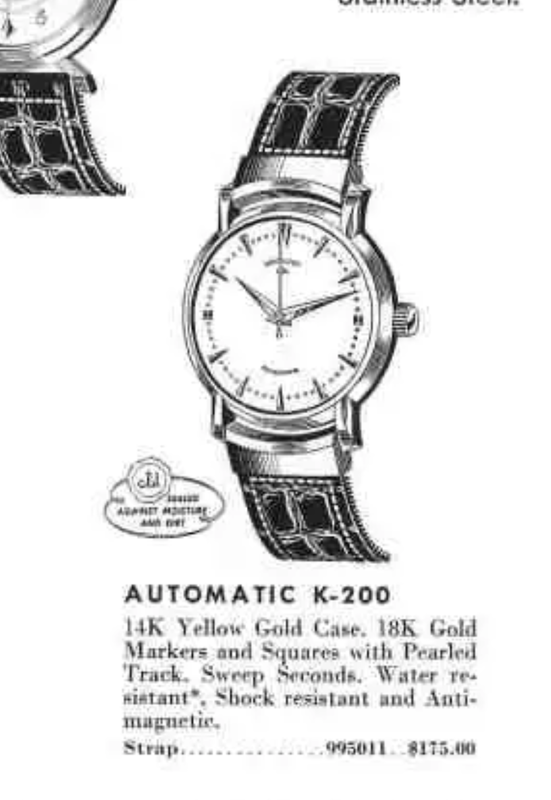 The 1954 model year had several watches cased in 14K solid gold, 10K solid gold, gold filled and stainless steel. Starting in 1955, solid 18K was offered too! Interestingly, three of the first 12 automatics were CLD models, as in "sealed" from the elements. You could develop an impressive Hamilton collection by focusing solely on the CLD models, as there are 19 of them (25 if you want all the dial variations). I started out way in collecting with an interest in finding all the CLD models but I realized fairly quickly that you stand a better chance of spotting Big Foot than of spotting a 1953 Tildon, or so it would seem. I know there are Tildon's out there some where... maybe Big Foot has one? If you want to land a full CLD collection, one of the more expensive CLD models you'll need to find is the 1954 Automatic K-200. It was produced for three years so it's fairly easy to spot in the wild but it doesn't come cheap. It has a heavy two-piece solid 14K case with integral movable lugs. The dial is sterling silver and it features solid 18K markers and a pearled track. In 1954 you could purchase it with a matching solid 14K bracelet. However, by 1955 the bracelet was dropped and genuine croc strap was the go-to choice for outfitting the K-200. Hamilton's first choice for automatic movements were ETA/Eterna-made, although fairly quickly the Kurth Freres (Certina) movements were predominantly used in K-series models. 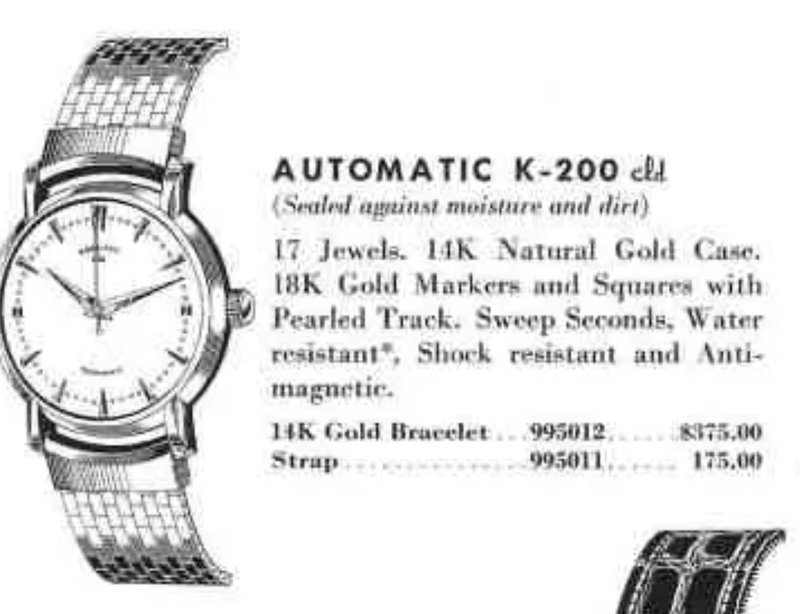 Anytime I've seen a K-200 it had the Eterna movement, as you'll see in a bit. My project watch came to me courtesy of a friend who caught the CLD bug early in his collecting years and he made a lot more progress than I did. 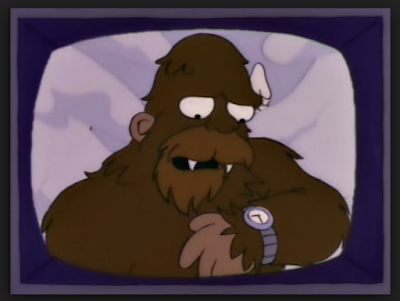 His watch is in very nice shape. One of the lugs is a little more floppy than the other but overall it's a nice example. The back of the case is nicely engraved with a Christmas dedication from 1955. Based on the variety of marks on the case back, and my friend's warning, this case back is going to be a challenge to remove. Just using a case knife proved futile so I had to resort to my "Persuader". This special tool is a spring loaded punch so when you press it into position, eventually it POPS! and sends an extra dose of pinpoint force toward the business end of the tool. The tip of the tool is a wedge and it will definitely leave a mark if you put it in the wrong spot. With the case back out of the way, the movement inside is what I expected to see. The five ball bearings in the center are still reflected in the logo of Eterna today. This is the only Hamilton-marked movement to not have been given a caliber number. One of the things my friend is known for is finding the unfindable... for example, he found what appears to be a new old stock K-200 case. It is noticeably crisper than the other case, and I thought that case was very good. So this is quite a find. Once the stem is removed, the movement and it's movement ring come out of the back. Once I removed the dial and hands, the first thing I noticed is this watch has a broken set bridge. The broken part is missing so the last guy inside this watch didn't replace the set bridge. My friend also included a movement from a K-400 in case I needed any parts... hopefully it has an intact set bridge. The large screw holds the oscillating weight in position. Once it's unscrewed the weight lifts right off. Here's another missing part, the automatic framework is normally held on with three screws. The last guy must have thought only two will do the job, as he left this one out. This movement looks like an ETA 1256 or a Hamilton 672 at this point. One difference is the balance shock jewels on this watch are a very early design. Based on the stamp under the balance, it looks to me like this movement is based on an Eterna 1248 UC. That grade was made from 1950 through 1954 so it could be that Hamilton switched to the Kurth Freres movements out of necessity. Here's another little bit of trivia for you. This movement is the only automatic movement to have received unique serial numbers. Of course, after 1955 none of Hamiltons movements received serial numbers. Everything is cleaned, dried and ready to be reassembled. It's running a smidgen fast. The beat error is acceptable and the amplitude is a little low, but I haven't fully wound it yet. A quick and slight tweak to the regulator makes an immediate change to the beat rate so that the two lines are now approaching horizontal. The lower the beat error, the closer the two lines will get. If the beat error was zero, there would only be one line. Lowering the beat error on this movement is a great way to screw up an otherwise fine balance. So I won't tempt fate unnecessarily. Here's what a proper set bridge should look like. It's a spring loaded detent to hold the watch in the winding position or the setting position and it's what you feel pop when you pull the crown out or push it back in. Okay... everything is ready to go into the new case. When is the last time you've seen brand spanking new vintage spring bars? Well, this K-200 would be the pride of anyone's CLD fleet, that's for sure. The dial isn't perfect but it's definitely better than most original K-200 dials I've seen. This watch now runs as well as it looks. I'm sure my friend will be very happy to give it some wrist time.